Speed Traps can catch you when you least expect it. Returning from a car trip through Germany, I'm very grateful for the fact I didn't crash the car I was driving, always a morbid possibility. But I did get one parking ticket that I paid for and a very unexpected speeding ticket. A Speed Trap Camera took a picture of me in a "traffic" moment on a deceleration zone on a turn off ramp. It was kind of cheating I think. I'm watching for traffic, not every nuance of speed limit as it changes this way and that. I had been "caught" in the automatic Speed Trap by the infamous European "Starenkästen" or Star Boxes. This is a box that measures the speed of your car and takes a picture of it, if it thinks you're speeding, and mails you the resulting ticket along with your fine. 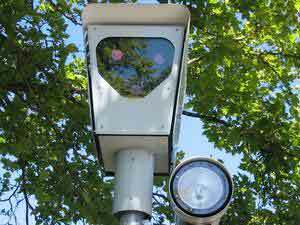 In the United States, the states of Arizona and Oregon as well as the District of Columbia and many major cities are the places (as of this writing) that speed trap cameras are being used. Anyway, I found out that Europeans have more than 10,000 of speed cameras units located throughout Germany, Austria, Switzerland, the Netherlands, Belgium and France. Some districts in Germany have seventy-nine of these things. The "Star Box" ticketed me on my first day driving when I was still suffering from massive jet lag along with trying to master a new car in congested German traffic. Again, I was concentrating on not crashing the car, instead of understanding each and every traffic sign coming my way. Years ago, when I first drove in Europe, there were absolutely no speeding tickets, and the traffic routes through cities were much easier. But with the massive crowding in European cities, along with a terrible rise in traffic congestion and accidents, something had to be done. 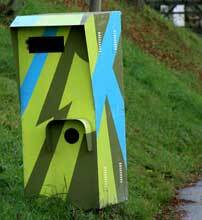 The only problem with the "Star Box" solution is that the locals know where all of these boxes are located, but the visitors do not. "Get the new guy..." This has always been a principle solution of local governments throughout the world, including the US. They won't wait to go through any court proceedings. They'll just pay the ticket. Free money to the local government. The revenue ticket, or speed trap as it was called 40 years ago, is definitely an export of the US that I'm not too thrilled with. You will just have to avoid the gaze of these one-eyed monsters if you are driving and want to enjoy a really wonderful trip to Europe!